These practical cases are a training guide to understand better how networking, security and high availability technologies work. Doubts and comments in the official mailing list! 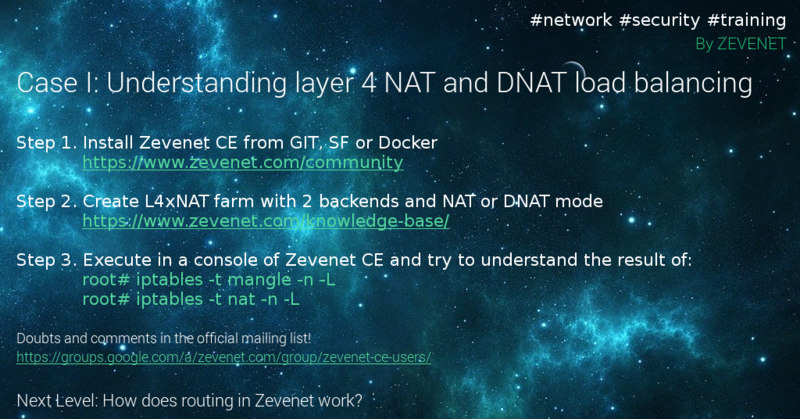 Zevenet layer 4 (LSLB – L4xNAT profiles) handle all these packets using netfilter subsystem through iptables and the network routing system. For this reason, when configuring a DNAT mode farm and execute the iptables commands we can find rules generated in the tables mangle and nat of netfilter. Further information about Netfilter tables here . – Then mark the packets according to a certain algorithm, in this case is a weight based on a probability method. Now that the incoming packets are marked, in the PREROUTING chain of the nat table we use the packet mark in order to change the destination address of the packet to one backend or another. For this example, the IP addresses 192.168.1.10 and 192.168.1.11 are the real servers. The conntrack table manages the destination address translation and in the DNAT mode, the return packet is managed by routes as the load balancer will be the default gateway of the backends. In the case of NAT, or SNAT as it’s commonly known, the conntrack manages not only the destination address translation but also the source address translation. In this case, the only difference with DNAT is that the replied packet it’s not managed by the routing system but by the conntrack table. So we can find just 2 new rules in the POSTROUTING chain of the nat table in order to perform the MASQUERADING with the virtual IP address of the farm. Further doubts? Ask to the mailing list!